This is part 2 of a 3-part article series to get you attracting more customers. If you haven’t read part one, please check out the first article here. You’ll need to read it to have an understanding of the points explained in this article. 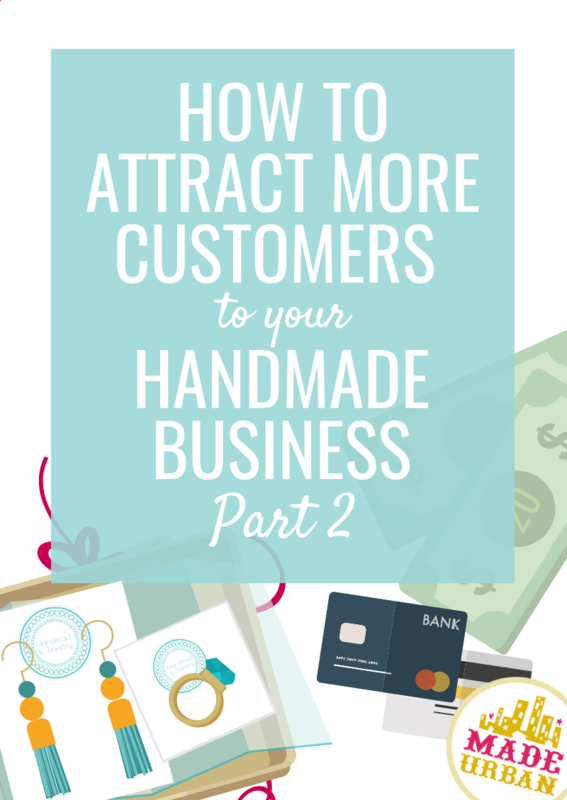 Article one covers why most handmade business owners turn to marketing when they want to attract more customers, but why that’s not always effective. Marketing is just one part of the “get more customers” equation. You must address what comes before and after marketing: creating and selling. Then make sure all 3 steps (creating, marketing, selling) are working together to attract more customers. Your amazing marketing efforts go to waste if your products aren’t up to par, or if your selling (i.e. your Etsy shop/craft show booth/sales pitch) is throwing shoppers off. Article one also covers BUYING FACTOR #1. There are three factors that must be in place for anyone to buy, and each factor must be addressed in the three steps to a sale (create, market, sell). More clarification on that is in article one. In this article I’m covering the second buying factor and how you can apply it to each step. Consumers don’t tend to buy luxury products everyday, which most handmade products fall under (luxury meaning, it’s not a necessity, e.g. food). So even though we may see amazing items every day, we don’t buy them until we have a reason to purchase. You must think about the specific customer you’re targeting and when they’re likely to have a reason to buy your products. Then you can apply that reason to the three areas of your business (create, market, sell). Obviously, the reason someone purchases will change throughout the year. So the products you offer, marketing message you use and your selling must coordinate with that reason. Let’s take a look at how each step on the path to more customers (create, market, sell) can be addressed when it comes to the reason consumers need/want to buy. Here’s how you can work on step one (create) of your business, to appeal to buying factor #2: they have a reason to buy, based on some of the common reasons provided above. When it comes to handmade products, the majority don’t solve a valid problem that drives consumers to a specific business. For example, “I don’t have the right earrings to wear” is not a true problem that drives people to purchase from a specific jewelry maker. They know how to solve that problem; hop online or go to the mall and choose a pair of earrings from the thousands of options. A true problem that attracts customers to you, is one that not every business can solve. You don’t need to be the only business solving the problem, but your business should be one of few solving it. Consider if your products currently solve a problem that other businesses don’t, or if you can create a new product or alter an existing one to solve a problem your ideal customer may be experiencing. For example, a bath and body vendor may sell soaps, lotions and bath products. In the winter, their customers may deal with dry skin from the cold weather. To solve that problem, they may decide to create a moisturizing soap, heavier lotion and moisturizing bath products. Now the consumer has a reason to purchase from the bath and body vendor. If they were simply selling the same soap and lotion that were no longer cutting it in the colder weather, the customer is not going to buy more of the same soap and lotion. You can create themed products around gift-giving holidays such as Valentine’s Day, Mother’s Day, Christmas, etc. Or for occasions that tend to happen during a certain time of year, such as weddings in the summer, graduations in spring, etc. You may even offer the same products but bundle and package them in a way that makes them more gift-worthy. Again, consider your specific customer and the occasions they’re likely to need gifts for. Items that tend to get a lot of wear and tear (e.g. a belt that’s worn everyday may need to be replaced every 6 months, or laptop decals that may get scratched up). You have a great opportunity to make more sales if your product is consumable. Repeat-customers are the most profitable customers. They require less time and money to market to, and they tend to spend more than first-time customers do. You must offer a product that needs to be purchased more than once, and have a way to follow up at the right time to remind customers to restock or replace. This falls under marketing, but a newsletter is THE BEST way to encourage restocking purchases. And the best part is: it can all be automated so you can make sales on autopilot. If you use a service such as Mailchimp (which will take you 10 minutes to set up right now…I’ll show you how to here) or Convertkit, you can set up automated emails so that a restocking message is automatically sent to a new customer X number of days after they purchase. You can even set up several automated emails in the sequence. For example, if I sold hand soap that lasted, on average, 2 months, I could set up 6 automated emails designed to follow up with a new customer for an entire year. This is a bit more advanced to do, but it’s not hard, it just takes some time to set up. I walk through techniques like this in HOW TO START, SEND & GROW A SUCCESSFUL NEWSLETTER. If you sell products such as clothing or accessories, you should take advantage of boosts in spending due to seasons changing. You could simply change the colors, patterns or materials to match the season (e.g. pastels and florals in spring). Scented products such as soap or candles can revolve around seasons too. Offering pumpkin spice in fall gives consumers a more compelling reason to buy than if you simply offer lavender, vanilla and lemon scents all year round. If your customer follows trends, be sure to stay on top of them by reading magazines, watching fashion runways, etc. and be ready to launch new products when new trends come out. If your customer loves to host dinner parties, they may do so for Easter, BBQ season, Thanksgiving, etc. If you sell table linens, you may launch a new line of products for each major dinner hosting season or occasion. You may create a business model that trains potential customers to understand; you only make a select number of products and once they sell out, they’re gone; you don’t restock them (until maybe next year). If you’re offering what people are searching for, when they’re searching for it, you’re going to reach more people and attract more customers. Here’s how you can work on step two (market) of your business, to appeal to buying factor #2: they have a reason to buy. When you consider the fact that consumers aren’t ALWAYS buying, they tend to wait for a reason to buy, you can be more effective with your marketing. It’s sort of like a friend emailing you every week, asking to borrow money; you’re going to start ignoring their messages. But if they only ask to borrow money once and a while, when it’s really important, you’ll pay more attention to that message. Using a mix of promotional and non-promotional messages in your marketing is a formula I encourage handmade business owners to follow. It’s especially effective when marketing through a newsletter; every email should NOT be asking for a sale. You can still promote your products, it should just be done in a less aggressive manner. Sort of like the Trojan Horse strategy I explain here. Details on how to use it for a newsletter is explained in HOW TO START, SEND & GROW A SUCCESSFUL NEWSLETTER. In fact, you can find over 365 newsletter ideas here to follow this effective marketing method (many ideas could also be used for social media posts). When those times come up that your customer is likely ready to buy, that’s when you STRIKE with a strong, specific, and targeted marketing message. Photo: picture of the candle on a white background. Who’s ready for patio time?! …without mosquitos? Lemongrass is a powerful and natural scent that keeps bugs away without spraying harsh chemicals on your skin. Photo: picture of the candle sitting on a patio table next to two glasses of wine at dusk, with patio lanterns glowing in the background. Your marketing should clearly reflect whichever “reason to buy” you’re appealing to. If it’s summer and you know your ideal customer likely needs to buy wedding gifts, your marketing should take on a wedding theme. If it’s a Wednesday and you know your ideal customer is likely making plans for the weekend and thinking about what she’ll wear, create a “girls night out” type post featuring your jewelry, clothing or accessories. Here’s how you can work on step three (sell) of your business, to appeal to buying factor #2: they have a reason to buy. When you know the specific reason someone specific is buying; your selling can become so much more effective. Consider all the ways a shopper might interact with your business through your sales channel and how you can appeal to the reason they’re likely shopping that particular week, month, or quarter. Colors – pastel colors can signify Easter and be used in a tablecloth, sign holders, props, etc. Signage – use Easter related keywords in your signage (e.g. instead of “hair accessories – $15” it may read “Easter Sunday Hair Accessories – $15”, or “Easter Table Napkins” instead of “Table Napkins”). Promotions – if your prices allow for discounts, you may offer one during the event hours to give shoppers more incentive to buy. Sales pitch – you may mention that your toys make a great alternative to place in Easter baskets instead of all that chocolate. Wrapping – if your products are commonly purchased as hosting gifts, you could offer gift-wrapping for an additional fee. Product photos – you may include an Easter related prop in photos of your products, such as tulips or Easter eggs. Wrapping – you could also offer a gift-wrapping option to be added on at checkout. Shipping options – you may offer rush shipping for an additional fee so last minute shoppers can receive their products before Easter. That’s how you might shape the “sell” process around your ideal customer’s reason for buying. Whichever reason you’re appealing to (e.g. a gift-giving holiday, a new trend, payday at the end of the month, wedding season, etc.) it should be apparent on your website, Etsy shop, or craft show booth through the visual elements and text/talking points. In the mosquito repelling candle example, you can see how applying “having a reason to buy” (the change in seasons) to each area of business, can help reach more people and gain more customers. CREATE – offering a product that is relevant to the season (mosquito repelling candle for summer) peaks more interest than offering the same scents year round or releasing new scents without a purpose. SELL – a basic description of the candle and photos won’t encourage as many people to follow through and buy as further explaining the benefits, helping them imagine the candle in their backyard and creating an incentive to buy. Choose the most relevant reason your ideal customer might be buying in the next month or two and consider how you can relate your products to that. No matter what you create, be sure it fits with your brand and style. Subscribers, followers, etc. will get bored of seeing the same marketing message over and over: Here’s a new product I made. Shake things up and make your messages relevant to what’s going on in their lives. Where do people go to buy your products? Your Etsy shop? Consider updating the photo, your announcement, rename or add a new section (e.g. Easter gifts/accessories/etc. ), which listings appear first, product names, descriptions and photos. The same idea can apply to your website. Your craft show tablecloth, props and signage may need an update to appeal to the reason people will be shopping and buying. Also consider how you might adjust your sales pitch. 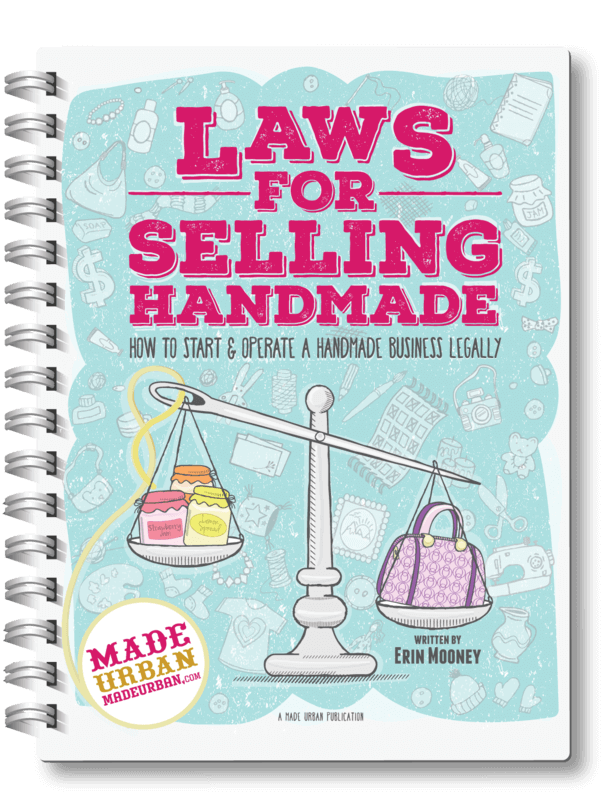 For a better understanding of the tasks that fall under these three areas (create, market, sell) and that are required to successfully run a handmade business, please check out THE SUCCESS PLANNER. Next week I’ll be sharing Part 3 and the final factor that must be in place for your shoppers to buy. If you’re not already a newsletter subscriber, you can subscribe here so you don’t miss it! Just wanted to let you know, this article was super useful! I’ll be bookmarking your website. You explain everything really well and in detail that I’ve yet to find anywhere else. Thanks! !